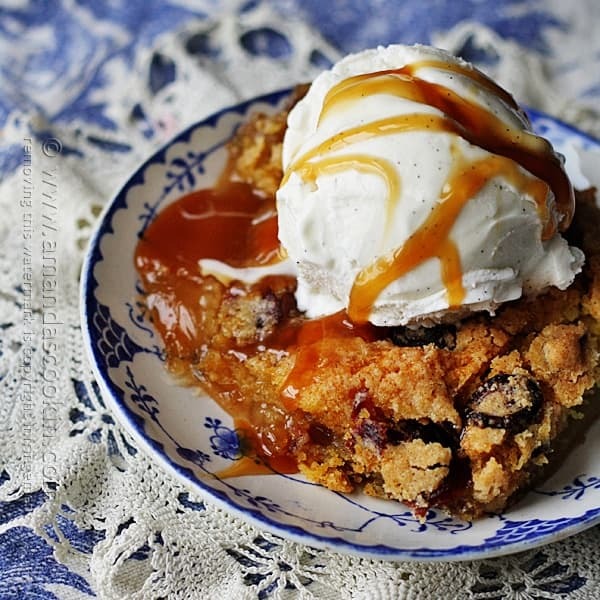 Honestly, it wasn’t until I hit my thirties that I thought apple cobbler was worth eating. Give me a piece of cake with frosting and I was all over it, but cobblers just weren’t my thing when I was younger. I think part of the reason stemmed from my childhood, as growing up I just don’t remember ever being offered a cobbler for dessert. I could absolutely be wrong, but my mom’s been gone a long time now, so I can’t ask and guess I’ll never know. 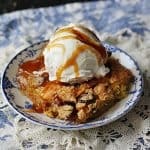 Regardless, I love apple cobbler now, and with a big scoop of vanilla ice cream on top, it’s one of my favorite desserts! My life has become pretty hectic lately, so I’m not baking from scratch as much as I used to. That means desserts have to be quicker and more convenient, hence using a boxed cake mix for this fall treat. 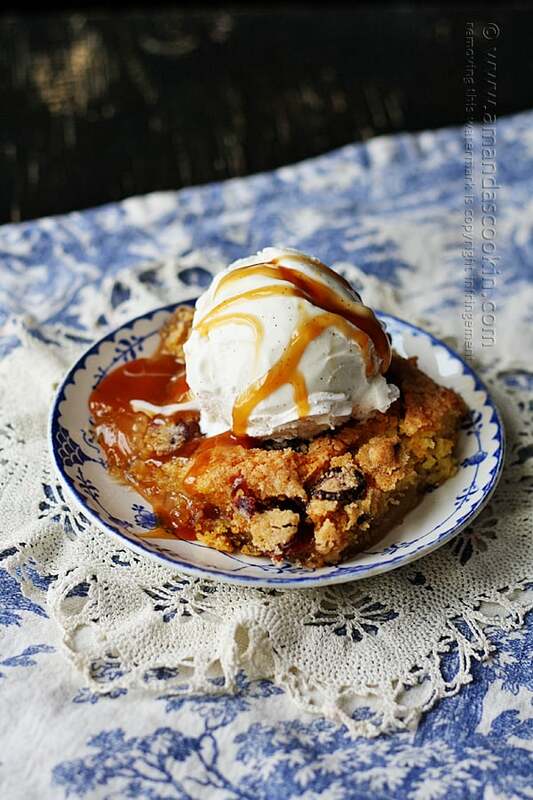 As always, a full printable recipe is available at the end of this post. 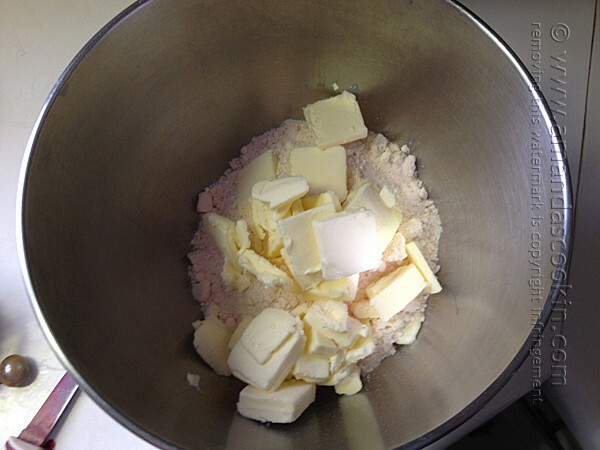 Combine dry cake mix and butter in a mixer bowl. Beat at low speed for about a minute, until crumbly. There may be large pieces of butter in the mixture, that’s okay. 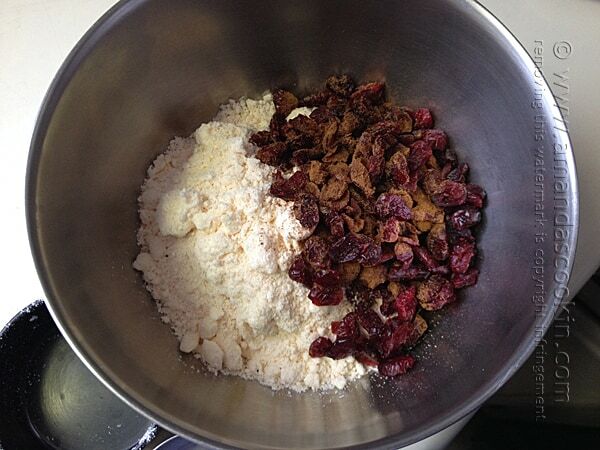 Remove 1 1/2 cups of the cake mixture to a medium bowl and stir in cranberries and cinnamon, use your fingers to toss the mixture if you need to. 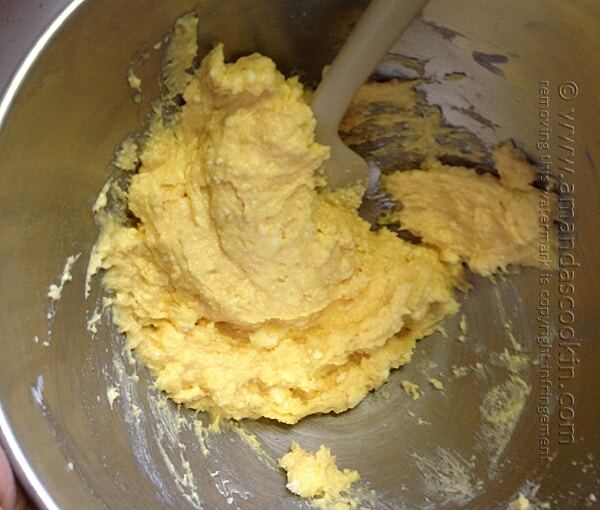 To the remaining cake mixture in the mixer bowl, add the milk and beat on low until all dry mixture is moist. Use a spoon to bring it all together. Again, there will be visible pieces of butter, you don’t want to overheat this mixture. Heat pie filling in a large bowl in the microwave until bubbly, about 4-5 minutes, covered. 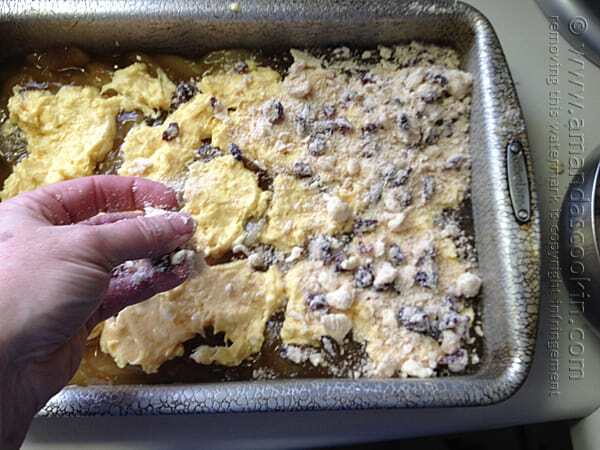 Pour hot filling into a 13×9 baking pan. 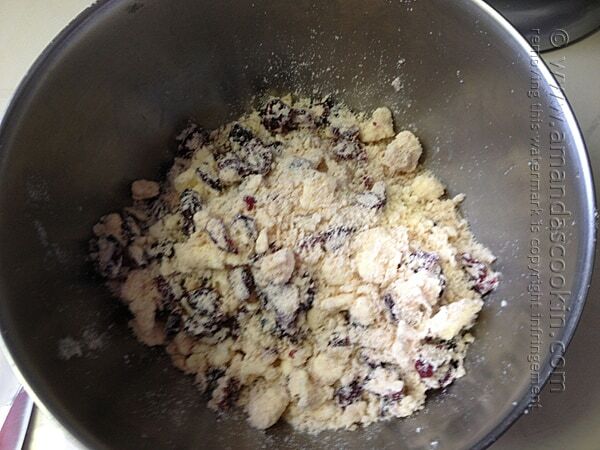 Top pie filling with dollops of cake batter then sprinkle with the cranberry topping mixture. 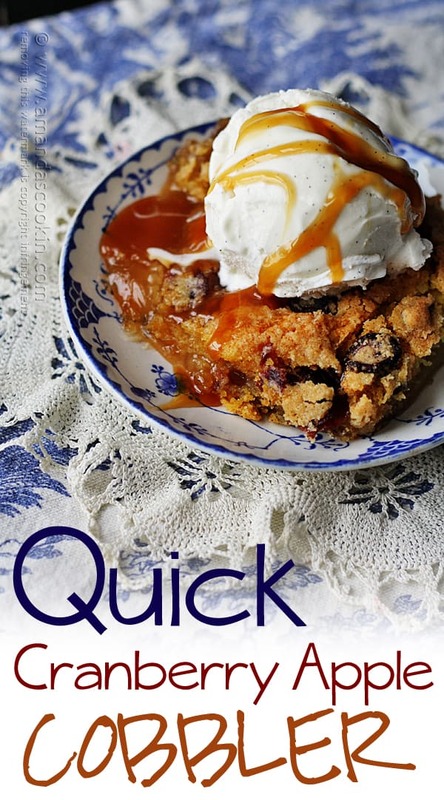 If you enjoyed this recipe, you’ll probably like some of the ones I’ve hand-picked for you below! I am wondering if I could use crasins in place of the cranberrys? I have a big bag of the crasins & they are very tasty of the cranberry flavor. Need use them up. Thanks & looking forward to making this one. 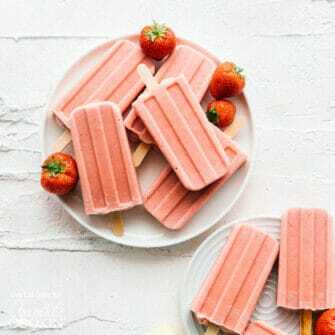 Yummy for sure :) I am sharing on my FB page today. Oh boy, does this look delicious! Thanks Sue! 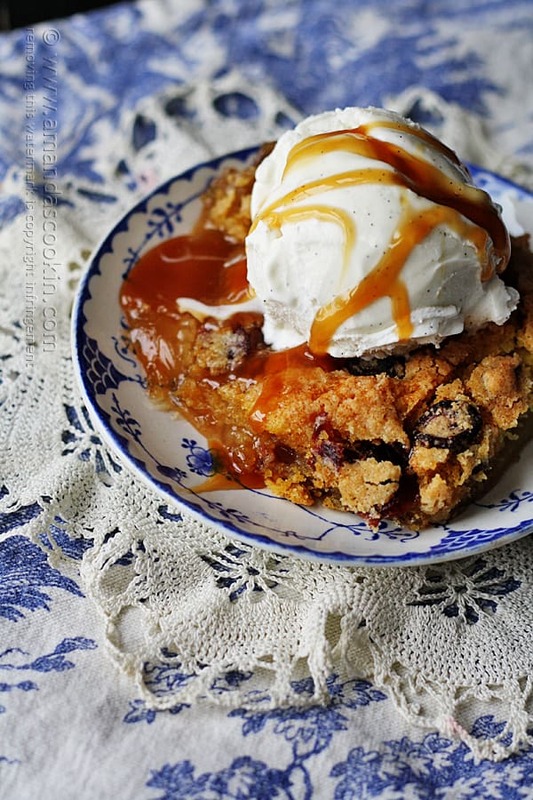 I had taken this dessert to my daughter’s work and it was a huge hit! Wow what a fabulous looking dessert! Perfect for a dinner party. I love the beautiful big scoop of vanilla bean ice cream too! Thanks Jessica! Yes, perfect for a dinner party. 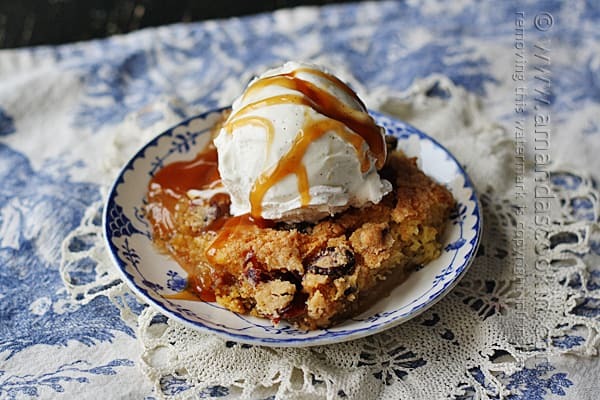 I love a dessert casserole for occasions such as that!